The Elders Committee of All Progressives Congress (APC) in Sokoto state has disowned Governor Aminu Tambuwal’s defection to opposition Peoples Democratic Party (PDP). The Chairman of the Committee, Sen. Bello Gada, said that the coalition of APC support groups has disassociated themselves from the action of the governor. He told journalists on Monday that Tambuwal did not contact him or members of the committee before the move to change political platform. He expressed loyalty of the elders to APC as a party and APC-led administration at all levels. 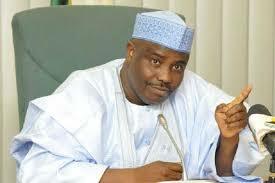 Gada explained that at no time did Tambuwal invite his committee on any matter until on the eve of his defection. “We are not part of any decamping decision as claimed by the Governor that he consulted people before his action. “There is no faction in APC in the state and we acknowledge the good economic policies, fight against insurgency, security challenges and corruption as well as infrastructural development by President Muhammadu Buhari led administration” Gada said. Gada explained that the coalition group will work towards the success of President Buhari and APC in 2019 elections. He said the governor’s comment on absence of federal government projects in Sokoto state was surprising, noting that President Buhari’s administration constructed Runjin Sambo-University Road in Sokoto metropolis. According to him, Buhari’s government executed Maradi junction border road, Sokoto-Tambuwal-Jega road, Shagari Dam project, establishment of 8 Divisions of Nigerian Army and ecological project among others. “ On behalf of APC support groups, we demanded Governor Tambuwal to account for N18.3 billion Paris Club refund, N38.7 billion bailout funds, N10.5 billion salary/pension arrears, N8.7 billion CBN/FGN agric interventions fund and N2.2 billion ecological funds from federal government’’ Gada said. Speaking also, Prof. Lawal Bashar, from APC Adalci Buhari Sak Organization, alleged that Governor Tambuwal had crippled local government administrations in Sokoto state as they were not doing anything during his tenure and workers salary were not paid as at when due. Bashar described Governor Tambuwal’s administration as the worst in the history of the state and stressed that present administrations in the nearby states of Katsina, Kebbi and Zamfara were far better in executing good projects. He added that the Governor’s exit from APC had become a relief and noted that APC would surely win all elective positions in 2019 elections. The Public Relations Officer of Buhari Support Organization in Sokoto State, Retired Squadron Leader Aminu Bala-Sokoto, said the coalition also included Buhari/Osinbajo Organization, Buhari Campaign Organization and others in Sokoto state. Bala-Sokoto appealed to National Headquarters of APC to organize a stakeholders meeting and reorganize the party structures in Sokoto state in order to tackle the situation adding that APC remains strong and viable with notable personalities across the state.